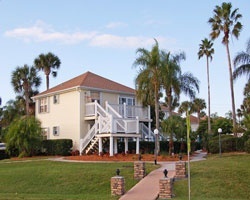 *Oyster Bay* resort features spacious one or two bedroom apartments and fabulous amenities! A beautifully landscaped property, guests can relax in the heated outdoor swimming pool and Jacuzzi, enjoy a game of tennis, or treat the kids at the children's playground. In addition, you can relax in the gazebo, have a great picnic with charcoal barbeque grills in the picnic area, or compete with a great game of shuffleboard. The resort also offers rentals (for a nominal fee) of 15-foot boats with 25 horsepower motors. Enjoy week 5 in Florida every year! Family friendly resort! Buyer May Receive A Title Fee Credit, Inquire For Details!